Money Brook Falls is a 70-foot, cascading waterfall found on the Northern slope of Mount Greylock. 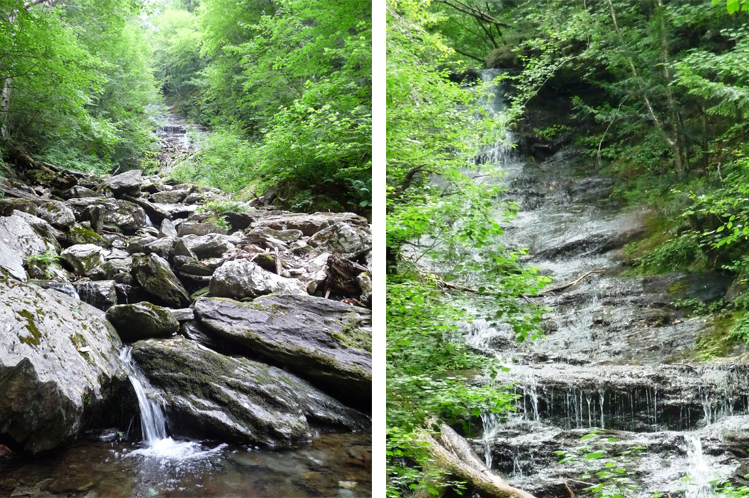 While not as spectacular as Kaaterskill Falls in New York (possibly because we missed Money Brook’s peak runoff, which occurs in late spring), it is still well worth the effort. And it is somewhat of an effort. The hike is categorized as “strenuous” by the Massachusetts DCR because of its 200-foot altitude gain over it’s three-quarter-mile length. But the trail is only seven-tenths of a mile so tough guys like us can still hack it. If ever we wonder why we’re doing what we’re doing, it’s because of days like these when we have the opportunity to go on great hikes in the afternoon, and then attend the symphony at night.